Waterside Place is a mixed use multi-family residential tower centrally located in the burgeoning innovation district of Boston between the new convention center and the Boston World Trade Center. The landscape involves an active streetscape that supports the lobby entrance and the street level retail, as well as two green roofs associated with the major amenity spaces of the project at the third floor level. room and the “click cafe”. 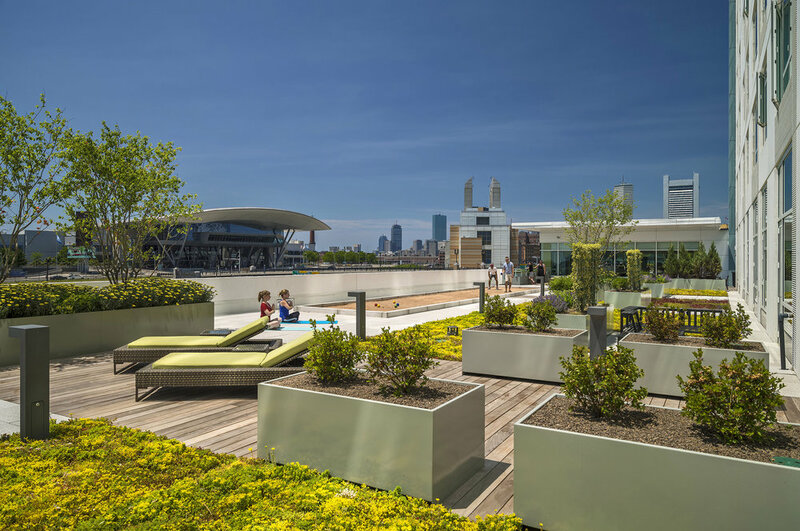 Further down the green roof, there is a number of individual vegetable gardens, generous seating, large tree planters and a bocce court for active community life. The north deck has a night time character complete with backlit furniture, grilling stations, ample seating and spectacular views of downtown Boston and the harbor. This deck is located off the “pub” and the “living room” and will feature outdoor grills and comfortable seating. Precast planters with a mixture of flowering and evergreen vines and shrubs, border the amenity level green roofs, spilling over the edges to hint of the green roofs above.